Dr Pepper has a heritage of elevating unique stories and people – such as Romeo Santos, Latin superstar and Grammy-nominated Bachata singer – who break the mold and dare to make the world their own. To continue its celebration of curiosity and individuality, especially among the Hispanic community, Dr Pepper is hosted a private concert in Miami Beach featuring Santos as part of its “Dare to Discover” campaign. This concierto was a huge celebration that kicked off the brand’s presence at this year’s Premios Juventud and also dared fans to discover the unique flavors of Dr Pepper – and in life! Romeo put on an amazing show for all those in attendance at LIV nightclub in Miami Beach…serenading us all to his bachatero hits. 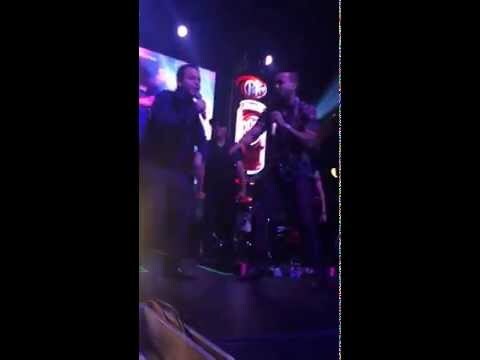 My friend and host of Ultra Fiesta, Luis Jairala, actually got to perform with Romeo on stage, anyone else feeling celosa? Apart from putting on a fun fiesta, this month, Dr Pepper has chosen two outstanding students to receive $75,000 in scholarships as part of the “Dare to Discover” campaign, which encourages Hispanic students to follow their dreams and reach for their goals. The annual scholarship program targets high school seniors of Hispanic heritage who are pursuing a higher education, ultimately selecting recipients based on academic achievement, financial need and an essay submission. Such a cool program, verdad? To find out more about Dr Pepper and the “Dare to Discover” campaign, please visit www. DrPepper.com.